When you look at China's annual rates of economic growth, no major problem is apparent. Here's a figure showing annual growth rates for China since 1980, generated using the World Development Indicators from the World Bank. Sure, there's a little dip back in the 1989-1990, and the growth rate has slowed a bit since the go-go days of 2006 and 2007 just before the Great Recession hit. But take a look just under the surface, and it becomes clear that the main engine of China's economic growth needs to change. The way I sometimes think about these issues, in looking at data on China's economy, is that something clearly happened around 2001. 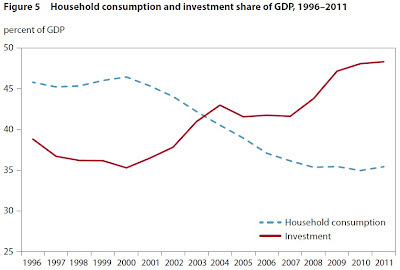 For example, here's a figure from Lardy and Borst showing patterns of household consumption and investment over time. 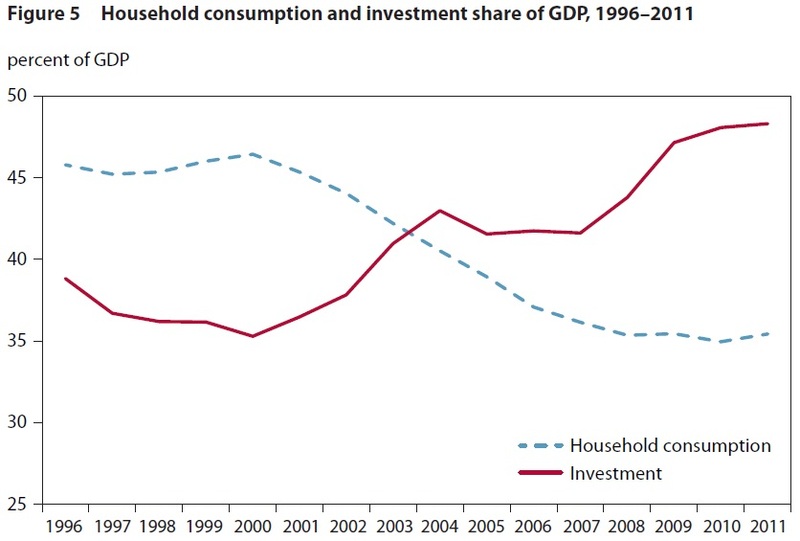 Starting around 2001, consumption starts a fall of about 10 percentage points of GDP, and the investment rate--which had already been sky-high at about 35% of GDP, rises about 10 percentage points of GDP. 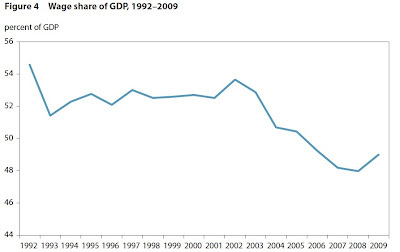 Remember, the years after 2001 are a time when economic growth rates were high and rising in China--but consumption as a share of GDP was falling. 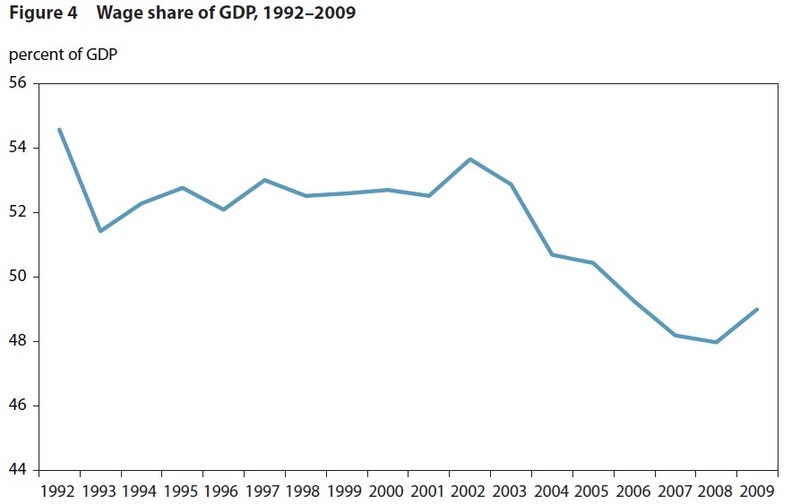 Similarly, wages as a share of GDP take a downturn after about 2001. The trade statistics also show changes happening around 2001. Through the 1980s and 1990s, China ran trade surpluses some years and trade deficits other years, and overall was fairly close to an equal balance between exports and imports. But around 2001, China's trade surplus starts climbing to about 10% of GDP in 2006, 2007, and 2008.. The main driver is a surge in China's exports, which were around 10-15% of GDP in the 1980s and 15-20% of GDP in the 1990s, but have been more like 30% of GDP and higher from 2003-2011. Here are a couple of figures using the World Bank data to illustrate these points. So what happened around 2001 that caused exports to take off? One factor was that China entered the World Trade Organization that year. In theory, this reduced barriers for both imports and exports, but China's exporters found it far easier to charge into the rest of the world than the rest of the world found it to charge into China. Another factor, emphasized by Lardy and Borst, is that back in 2001 China's central bank was keeping the exchange rate of its currency pegged to the U.S. dollar. Thus, when the U.S. dollar began to depreciate in value in 2001, China's currency also depreciated against all trading partners other than the United States--thus providing an additional spur to exports. In most economies, when businesses start selling a lot more, then households end up making more money, too. Either the higher sales get passed along in the form of wages to workers, bonuses to managers, interest payments to bondholders, or dividend payments to shareholders. But China's financial sector remains underdeveloped, and when firms found themselves sitting on much higher profits and revenues, their easiest course of action (and one encouraged by the government) was to plow those funds back into investment, rather than in one way or another having them end up as household income for consumption purposes. Everyone from outside economists to the Chinese government seems to agree that "rebalancing" China's economy toward greater consumption is needed, and a variety of policies are available to help make this happen. 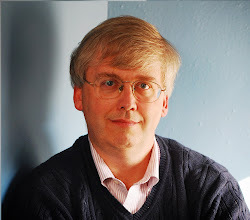 For example, Lardy and Borst emphasize several steps: 1) letting China's exchange rate continue to fall, which will exert pressure to reduce China's exports and increase imports; 2) allowing interest rates to rise, which will reduce the incentive of firms to borrow and invest and put more income in the pockets of savers; 3) removing the controls that keep energy prices artificially low, which effectively provide a subsidy to heavy manufacturing, rather than domestically-oriented service industries; 4) a rise in government spending on health and education services, especially those targeted at the poor. Woetzel, Li, and Cheng from McKinsey take a slightly different emphasis, and focus on what kinds of policies might help to raise household incomes, thus rebalancing consumption in that way. Thus, they emphasize another set of policies: 1) government policy-makers should scale back on their efforts to hold down wages; 2) deregulation of the financial sector could help household savers get more money and small and medium firms have greater access to capital; and 3) China should encourage entry of new firms in many industries. In some ways, these suggestions can be seen as a way of trying to build the connections from the business sector back to the household sector, so that when companies make money, the gains turn into higher household income rather than an even-higher surge of investment. The hardest time to reform can sometimes be when things seem to be going reasonably well. (For example, consider the list of economic reforms that the U.S. economy did not implement in the years leading up to the Great Recession.) China's economic growth rate remains high. Its trade imbalance has come down a bit in the last few years. But China's leadership has shown an intriguing streak of pragmatism and flexibility in its economic policies over the last few decades, and the time has come for one more change of pace for the world's second-largest economy.